1-Palmitoyl-2-linoleoylphosphatidylcholine monohydroperoxide (PC 16:0/18:2-OOH) and 1-stearoyl-2-linoleoylphosphatidylcholine monohydroperoxide (PC 18:0/18:2-OOH) were measured by liquid chromatography/mass spectrometry (LC/MS) using nonendogenous 1-palmitoyl-2-heptadecenoylphosphatidylcholine monohydroperoxide as an internal standard. The calibration curves for synthetic PC 16:0/18:2-OOH and PC 18:0/18:2-OOH, which were obtained by direct injection of the internal standard into the LC/MS system, were linear throughout the calibration range (0.8–12.8 pmol). Within-day and between-day coefficients of variation were less than 10%, and the recoveries were between 86% and 105%. The limit of detection (LOD) and the limit of quantification (LOQ) were determined using synthetic standards. The LOD (signal-to-noise ratio 3:1) was 0.01 pmol, and the LOQ (signal-to-noise ratio 6:1) was 0.08 pmol for both PC 16:0/18:2-OOH and PC 18:0/18:2-OOH. With use of this method, the concentrations of PC 16:0/18:2-OOH and PC 18:0/18:2-OOH in the lipoprotein fractions during copper-mediated oxidation were determined. We prepared oxLDL and oxHDL by incubating native LDL and native HDL from human plasma (n = 10) with CuSO4 for up to 4 h. The time course of the PC 16:0/18:2-OOH and PC 18:0/18:2-OOH levels during oxidation consisted of three phases. For oxidized LDL, both compounds exhibited a slow lag phase and a subsequent rapidly increasing propagation phase, followed by a gradually decreasing degradation phase. In contrast, for oxidized HDL, both compounds initially exhibited a prompt propagation phase with a subsequent plateau phase, followed by a rapid degradation phase. The analytical LC/MS method for phosphatidylcholine hydroperoxides might be useful for the analysis of biological samples. 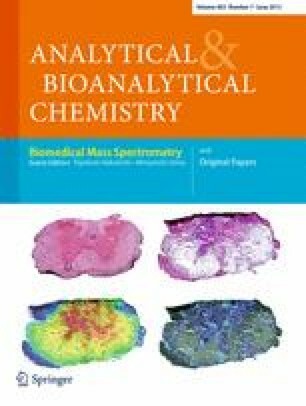 Published in the special paper collection Biomedical Mass Spectrometry with guest editors Toyofumi Nakanishi and Mitsutoshi Setou. This study was supported in part by Sapporo Biocluster “Bio-S,” The Regional Innovation Cluster Program, The Ministry of Education, Culture, Sports, Science and Technology, Japan, and by a Grant-in-Aid from the Japan Society for the Promotion of Science.